Two Dunfermline students are bound for The Hague to follow in the footsteps of the town’s greatest benefactor, Andrew Carnegie. Jenna Yeates and Lewis Steer will continue the peace-building mission of the philanthropist who founded the Peace Palace in 1913 in his pursuit of world peace. The duo will represent Carnegie’s birthplace and add to Scotland’s youth voice in the first edition of the Carnegie Peace-Building Conversations, an international dialogue being convened in the Peace Palace from September 24 to 27 “to generate fresh perspectives on peace-building and conflict resolution”. Jenna and Lewis – whose participation is being sponsored by the Carnegie Dunfermline Trust and the Rotary Club of Dunfermline – are both former pupils of Dunfermline High School. 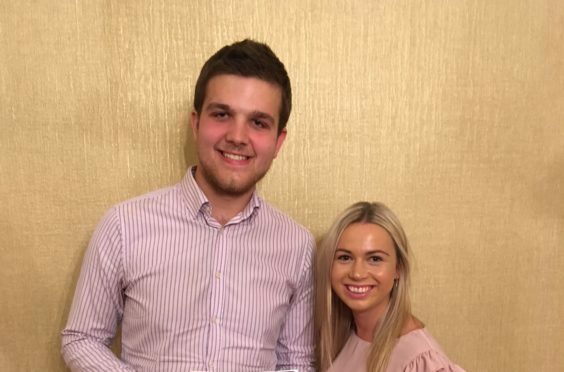 Jenna has just completed her third year at Aberdeen University, where she is pursuing an MA degree in educational studies, while ex-head boy Lewis is a third-year student at the Royal School of Veterinary Studies in Edinburgh. Jenna said she was “honoured and excited” to have been asked to represent the youth of Scotland at The Hague. “Hopefully, the conference will allow Lewis and I the opportunity to meet youths from other cultures and to discuss their experiences and exchange views on peace-building projects,” she said. Lewis added: “I’m thrilled to have been given the chance to represent Andrew Carnegie’s birth town and the opportunity to contribute to these important and topical discussions. Project director and Carnegie International Fellow Angus Hogg, said that by connecting more than 300 leading stakeholders from various backgrounds and generations, the conversations aim to generate unexpected insights and routes for progress in promoting world peace. The conversations are an initiative of the Carnegie institutions worldwide and the Carnegie Foundation which owns the Peace Palace.